Aluminum Extrusion 3D Printer Cabinet — Steven M. Caruso, Designer. A few months ago, I moved my studio from Industry City to a private space in the Prospect Park South historical district. It’s been a great excuse to buy weird tools at estate sales, stockpile foamcore, and saw some wood. Practice makes perfect, and I’m practicing, but I’ve never been particularly handy with woodwork. Even in design school, I did my best to make up for my shoddy paint and diamond-hard glue squeeze-outs with beautiful 3D models and renderings. So if I want to make anything worthwhile I’m going to have to join the 21st century and get a 3D printer. And since I want things to be easy, but I like to suffer, I’m eyeing up a Prusa i3 kit, so I can put together this complicated, high-tech machine myself. In fairness to me, I can put together anything from Ikea without breaking a metaphorical sweat (I sweat profusely at all times in all conditions) and I read my car’s owners’ manual cover-to-cover two whole times so I think I can handle it. My first plan was to set it up next to my desk, so I could watch it print and see the progress as it happens. But it turns out that, depending on the filament you print with, they can release some pretty weird and bad fumes. Even PLA, polylactic acid, a plant-based polymer, can create a cloud of harmful nanoparticles. I smoked cigarettes for years, and have breathed in plenty of blue foam dust in my day, so I’m not historically cautious about ventilation. However, I owe it to my cat to provide a healthy and clean environment, and reckless abandon begrudgingly belongs in my 20s. This week’s Render Weekly challenge is to “Download and render something from McMaster-Carr”, possibly the most exciting online hardware catalog. As much as I love a ULINE catalog — who knew plastic bags came in so many different sizes? — nothing beats McMaster. It’s Christmas every day when McMaster-Claus comes down your mail chute. 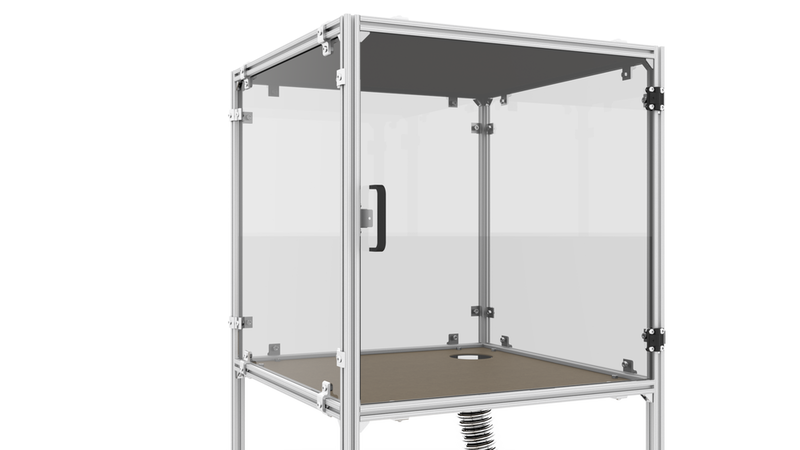 For this week’s Render, I’m sharing a design for a 3D printer enclosure designed and built from McMaster-Carr parts. Specifically, their T-slotted aluminum extrusion system, which appears to be generic 80/20 parts. I love this stuff. As a LEGO-loving child, nothing would make me happier today than a storage unit full of 80/20. Here’s the design below, with step-by-step assembly instructions. Click here for a full parts list with quantities and unit/total costs, which I’ll reference below. If you build it, please share your photos and tag me if you post it on Instant-Graham! Fully-assembled printer enclosure with ventilation hose. First, assemble the frame. I’m using 5’ lengths for the upright pieces and 2’ for the cross pieces. This will give us a 2’ cubic volume for the tool, and raise it 3’ off the floor for easy use. That’s typical counter / workbench height. If you use screw-on hangers to attach the acrylic panels, and want to use the included fasteners, make sure to slide in the hardware before you put the whole frame together. Alternatively, you could order drop-in fasteners and add them afterward. I think I will do that, since I’m forgetful and don’t want to have to take the whole thing apart. When the time comes, I’m also going to explore fitting panels using rubber gaskets, and potentially save $200 on the project total. Optionally, you can order corner pieces without a T-slot on two faces for a cleaner look. I will use standard extrusions because they’re slightly cheaper, and I can take it apart and use them for something else later on. 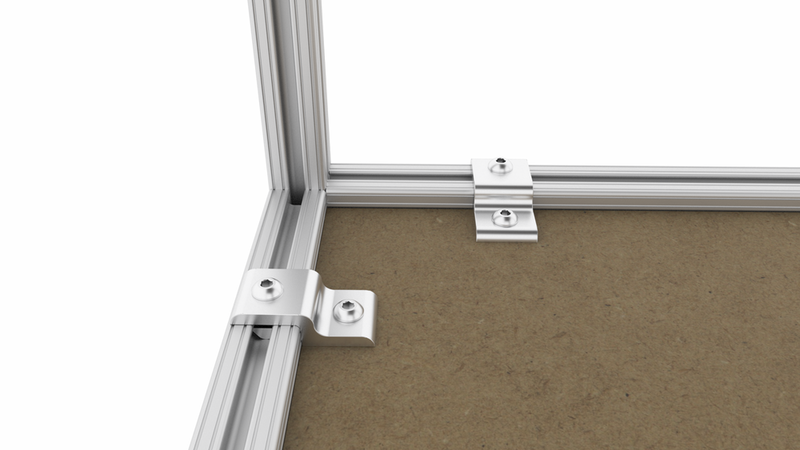 To complete the frame assembly, slide in the included hardware and screw in the mounting brackets. This structure should be indestructible. Not pictured, but this is also a good time to pop in the end caps on the bottom ends so your floors feel good. Next, install the bottom shelf, tool platform, and top shelf/ceiling panels with these screw-on hangers. Hopefully you have either remembered to slide in the hardware, or ordered some drop-in fasteners! The panel-side holes are tapped, so you may be able to just use the included hardware to attach them (in which case my rendering shows the screws backwards). Since I’d like to be able to store my anvils and cinderblocks on these shelves, I’m going to attach them with a nut and not rely on the threaded hole to keep it together. I’m also using 2’ x 2’ MDF project panels from Home Depot here, but if you have an extra $120 you can use the acrylic or polycarbonate panels to make this a fully McMaster build. You could also use the mesh on the bottom. Up to you. This can be anything. You will need to drill holes for the bolts to go through. The panel hangers need to be attached from the bottom for the tool platform, otherwise they’ll interfere with the acrylic panels attached later. You could do the bottom like this, too, if you wanted. Hangers need to be on top for the ceiling panel, for the same reason. Mount three of the four acrylic panels on the sides of the frame like so. Again, this may be possible using press-fit “dust cover” gaskets, which I’ll probably attempt when building it. And since they are only meant to contain fine dust, not necessarily provide a clear view of the interior, you could substitute clear coroplast, MDF or even foamcore if you don’t need to see through. I’d only insist on the front panel being acrylic or polycarbonate. Assemble the door by drilling holes for the handle and hinges, then screwing them on. Attach the magnetic latch plate with double-sided tape. If you don’t like this handle, there are many other choices! Attach the magnetic latch to the frame and install dust covers into the channel around it. The dust cover will help the door seal closed. If you’ve forgotten to slide in the hardware for the latch, you can probably undo the bracket above and drop it in still. Install the hinges to the front of the frame. At this point you can slide the fastener hardware in from the top. 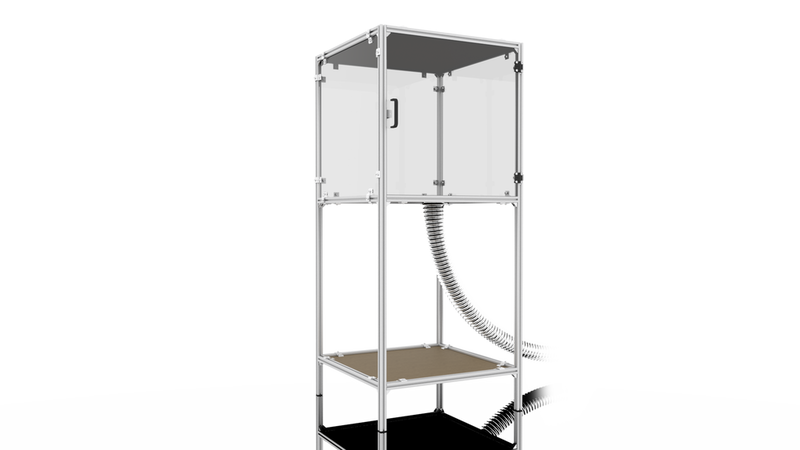 You should now have a fully-enclosed tool cabinet that will easily fit a kit 3D printer! Use a hole saw, or chew through like a beaver, to make a 4” cut-out in the shelf panel, then press-fit a flexible hose to ventilate the cabinet. Use some RTV or duct tape to seal up the hole, and send the hose out a window. Alternatively, do not install the hose and enjoy a face full of VOCs and aerosol nanoplastics every time you open the door! That’s all there is to it! As shown, this can be built for about $750, but possibly as little as $500 with some substitutions for insert panels and panel hardware, oddly the most expensive parts. Again, if you build this or some variation, I’d love to see how it turns out! I’ll share my own progress when I get to building it myself.